Why, When and what with? Why– There are many applications for waxes when glazing or decorating ones work. As makers we may simply want to wax the clay so that the waxed area resists or repels the glaze. As an example one might wax the base of a mug. 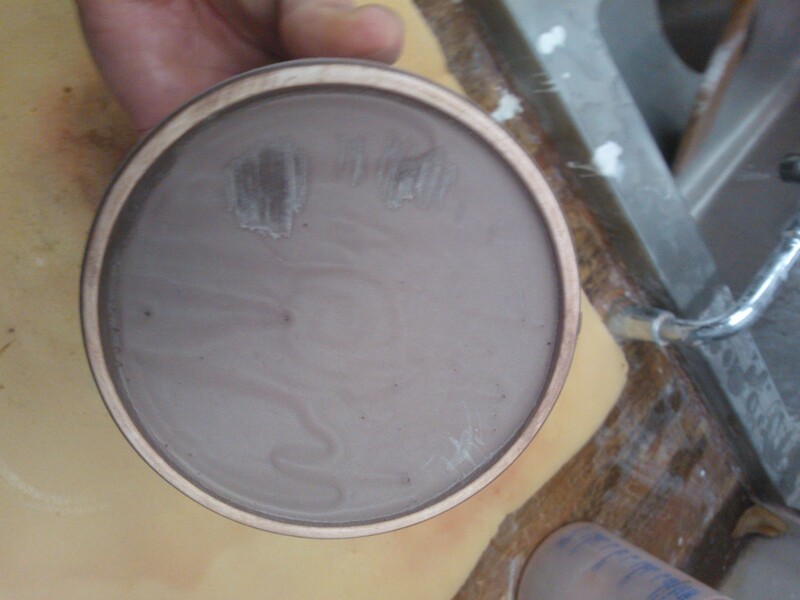 We wax the base of the mug so that it will be free of glaze. 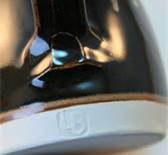 If we don’t do a good job of the waxing then the glaze may fuse onto the shelf acting as a high temperature glue. The molten glaze bonds the pot to the shelf potentially ruining the mug and scarring or destroying the shelf. A costly error! A general misconception when using wax is that it can be painted over glaze and this will stop the pot sticking to the kiln shelf. It won’t. The wax burns off exposing the glaze and the glaze then fuses the piece to the shelf. Insert a very frowney face here! One may also want to use wax as a decorative technique. As an example one might wax the foot of a bowl then glaze the bowl in a dark glaze. After the glaze has dried wax can then be applied over the first coating of glaze. A second contrasting light coloured glaze can be applied over the top. The waxed area will repel the second glaze and the dark glaze will show through. The areas that have both dark and light glaze without wax will blend together to create something else. It’s a fun technique. The plate to the left is by Hamada and demonstrates how simple wax brush marks can be really effective. Beware of applying multiple coats of thick glaze to your pot as the pot may struggle to dry. The glaze will then crawl, flake off or run off the pot in the firing. When?- Generally waxes are applied onto bisque pots wherever one wants to repel the glaze. What types of wax, hot or cold? One could use any old candles or bees-wax, coloured waxes or clear in an electric fry pan. Simply heat the candle in the fry pan until it melts. Some waxers add cooking oil or kerosene (fire hazard) to help the wax flow off the brush. 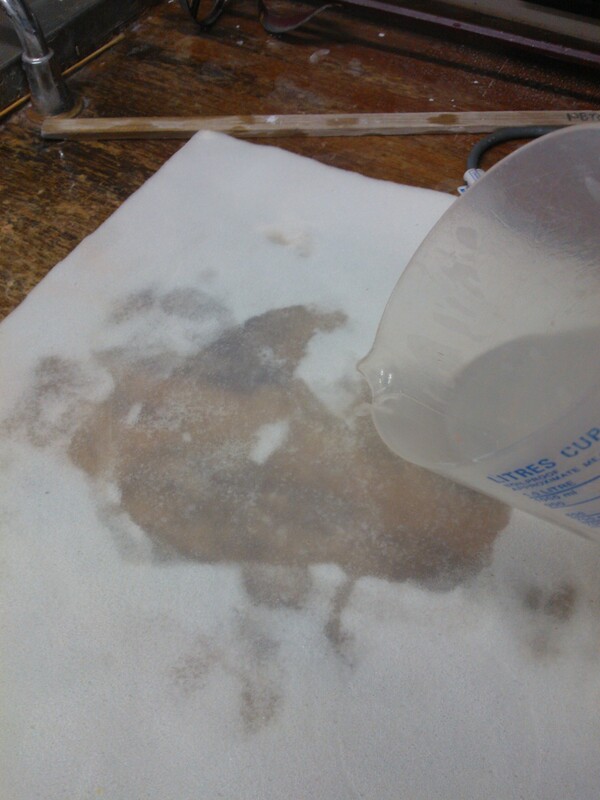 This also softens the wax so it does not crack off as it dries on the piece. If one is glazing the foot of a piece then melt just enough wax so the piece can be placed directly on the base of the fry pan to achieve an adequate coat. Hot wax can also be brushed on. One must be deft and swift when brushing hot wax. Dedicate a few brushes to waxing as they are not much good for anything else once they hit the fry pan. Make sure your brushes are dry before placing them in the hot wax. Hot wax is a great resist however there are a few downsides. The smoke is a carcinogen. Cold wax is another option and much safer. There are several on the market and some of them offer good resist and some produce poor resist properties. By poor I mean that the glaze wets down on the wax and does not pull back. Vvvvvvvery frustrating! One can use cold wax in the same way as hot wax. Some decorators dip their brushes in washing up liquid prior to dipping in cold wax to help preserve their brushes however I simply dedicate a series of brushes to cold wax. If you wash the brush out in hot water before it dries on the brush one can keep wax brushes in pretty good condition. One can thin cold wax with water. Once the wax dries on the brush or pot it repels water. 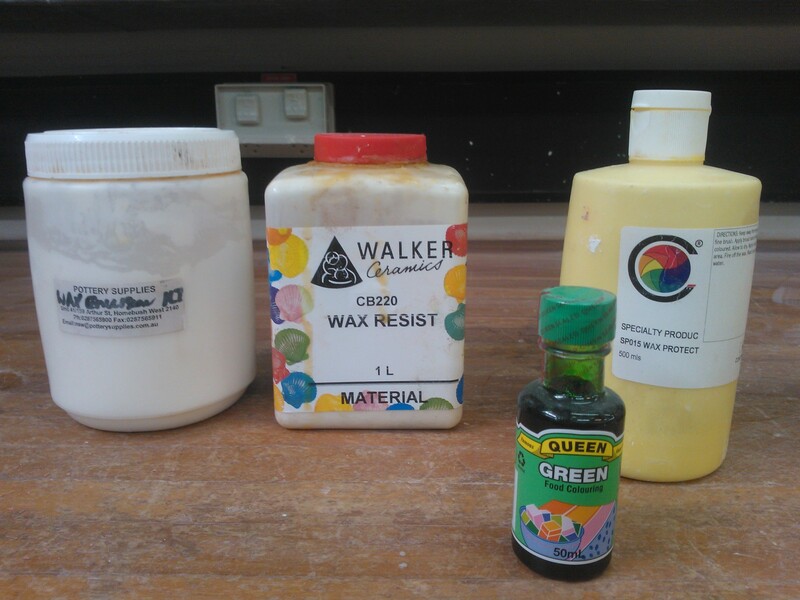 Colour your cold wax with food dye so you can see it more easily. Take care not to handle the waxed areas since the wax can peel off or the residue that’s left on your fingers can transfer from pot to pot creating areas of unwanted resist. Don’t rest waxed surfaces against other pots. The wax transfers creating unwanted areas of resist. An example would be stacking waxed plates on top of each other when studio shelf space is at a premium. If you have to stack waxed objects then place newspaper in between. If you drip or paint wax in the wrong place there are a few removal options. One could re bisque the object or scrape as much surface wax off with a metal kidney and then sand the remainder off with sandpaper. I think one could also remove the wax with Kerosene or Turps however I am not 100% sure. If you must work with hot wax then make sure you work in a well ventilated area or close to an extraction fan. If one is banding wax on with a brush then do it at the potter’s wheel. Utilizing the wheel means that both hands are free to steady the brush rather than juggle a banding wheel. Hot wax can peel off glazed surfaces. Wax the pot when there is as much moisture left in the glaze as possible, it’s stronger and handles the wax better. If the pot is really dry and powdery the wax will struggle to adhere so damp the glazed surface with an atomizer spray bottle first and then wax. If your hot wax still peels off then soften it with vegetable oil by adding to the hot mix “to taste” until it does stick. Get to know your glazes. Which ones are fluid, which are stable. This will help you judge how far up the side of the pot you need to wax. If one is simply using wax to stop the glaze covering the bottom of the piece then it’s worth considering sponge wiping as an alternative. Get some sheets of thin sponge from Clark Rubber. 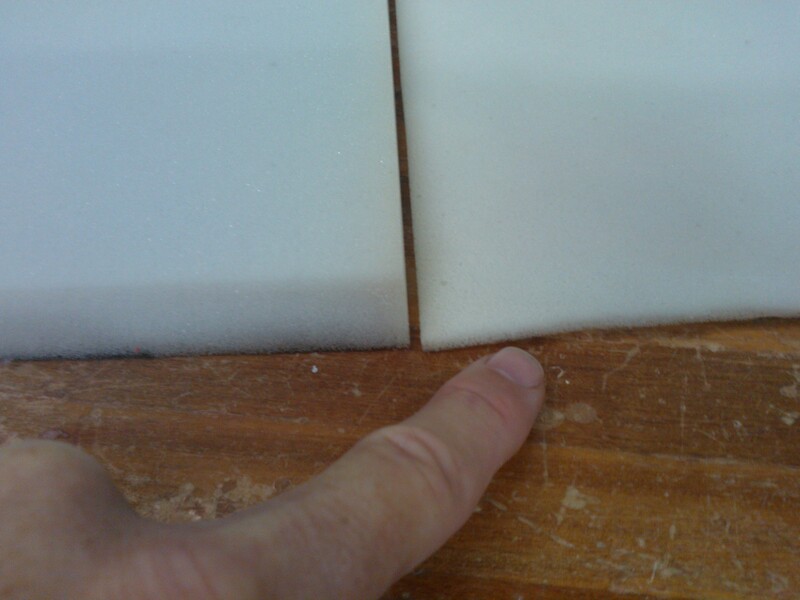 Sponge thicknesses of 1 to 1.5 cm work well. Take your piece and wipe the excess glaze off the base by resting it on the wet sponge and wiping it over the sponge. move around on the sponge until there isn’t any glaze coming off. 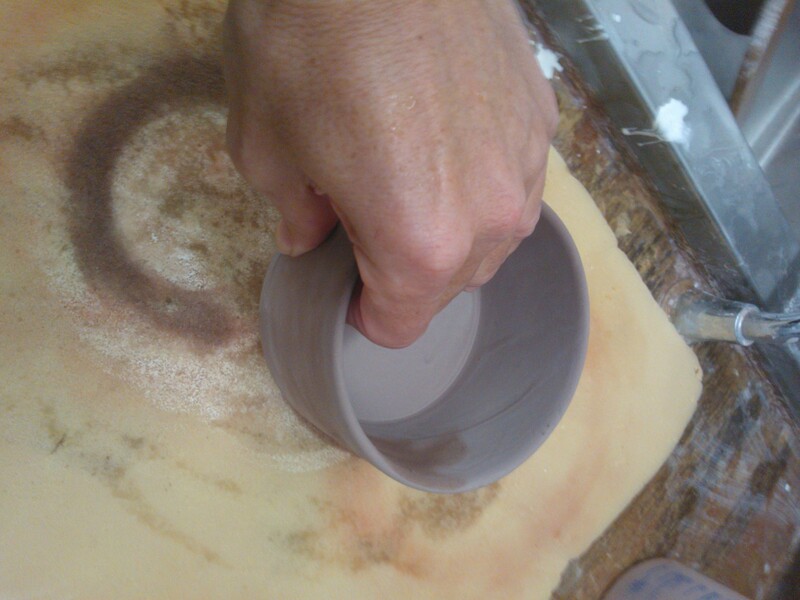 How hard one pushes down during the wiping will control how far up the pot wall the glaze is wiped off. Sponge wiping is my preferred method. The day I started sponge wiping the “hot wax fry pan” took a speedy trip to the bin. If the piece has a lid then I would use a good cold wax for the gallery and sponge wipe the base. A nice tutorial on waxing – very smooth (ok, shoot me!). It’s good to have in a written form that can be referred back to. Are you taking requests for further tuts? I’m curious if you can stack pieces that have wax resist on them in a bisque firing? There would only be underglaze present and very small amounts that will most likely not come in contact at all with the stacked piece. Aka I have plates I’m making and I’ve done a wax resist on the top side and carve into the leather hard clay once the wax resist dried. Can those plates be stacked now and will the wax resist burn away between the plates? Yes wax resist plates could be stacked however take care and consider the location of the underglazes. Some underglazes (many of the blues) are volatile and the colour can transfer onto the back of the piece above when the wax melts. as always ‘try it and see’.